For 17 years, Dorothy Dickerson has owned Books and More, the quiet book store and coffee shop in downtown Albion. Next month, Albion residents, Jim and Staci Stuart, will be changing Books and More into Stirling Books and Brew. Originally, just the building was for sale. When the Stuarts assumed ownership of the building, Dickerson mentioned that she would love to see the space continue to be a bookstore and coffee shop. “We told her, at the time of purchase, that we would really do everything we could to try and make that happen,” said Mrs. Stuart. Dickerson will continue to work at the shop, as well as her staff. Though the Stuarts have kept many aspects the same, they’ve made some great additions as well. The name “Stirling” is nothing random to the Stuarts. The name Stuart is of Scottish descent, and while on a trip to Scotland, the Stuarts visited a town called Stirling. The city’s soccer team was called the “Stirling Albion,” which they thought would be fitting for their new store here in Albion. Beginning April 1, the shop will close down for a top-to-bottom renovation. The Stuarts plan to decorate the space with a European feel, painting the walls warm colors with leather chairs and couches. As for books, the young adult and children’s sections previously in Books and More will be expanding. Stirling will also have a trade-in program where you bring in old books and receive credit to use towards half of your next purchase. The cafe will feature new items, including bubble tea, juices, a bigger selection of coffee and a wide variety of baked goods. “One of the watch words we want when we open the coffee shop is ‘excellent.’ We want you to walk in and go, ‘Ah, I like this place,’ so we are looking for things that are excellent,” said Mr. Stuart. To keep the focus on the community, the Stuarts hope to bring in local bakers and possibly the Food Hub to provide goods to their store. Corinne Atchison, who runs the Palmer House Bed and Breakfast with her husband, is the first one to be baking for Sterling Books and Brew. The Stuarts said that when seeing and sampling Atchinson’s goods, it brought that ‘excellent’ aspect they were looking for. Stirling Books and Brew will still include items for purchase other than books and coffee. They will have a limited supply of quality, local merchandise that will include specialty mugs, vases, oil decanters and other locally made items. The Stuarts are enthusiastic about the opening of Sterling Books and Brew and hope it will be more than just a space for books, coffee and locally made gifts. “We think of ourselves as a bookstore and a coffee shop, but we want to be a venue,” said Mr. Stuart. Their goal is to open up the space for college and community members to use for alternate purposes. The Stuarts plan to have live music and author visits but hope that others will use the space for club meetings, church groups, children’s events or any other purpose. “Our goal for the first year is to get back to breaking even because right now [Mrs. Dickerson] is not. That’s why it’s so important to us to get people through the door. We want it to be a place people want to hang out,” said Mr. Stuart. Alongside the inside renovation, the Stuarts are refurbishing the outside with new paint and a street sign. During the roadwork on Superior Street this spring, the store will be accessible from the back. The Stuarts welcome anyone to use the building as a passthrough to the sidewalk in order to access the Ludington Center during the construction. In the future, the Stuarts plan to expand the store into the open space next door. It needs a total renovation, and as of now, they want to focus their attention to their current space. 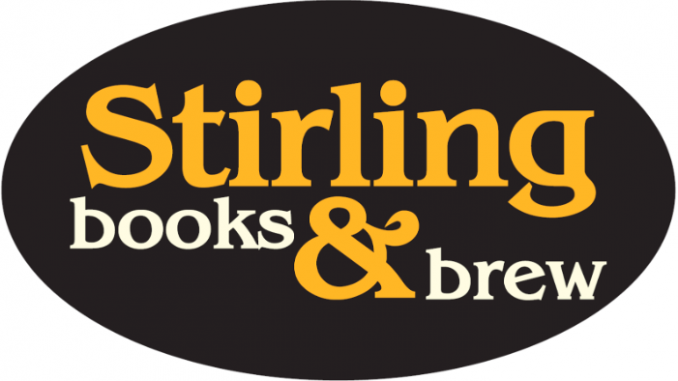 Renovations are scheduled to take about a month, and Stirling Books and Brew will be opening May 1, with a ribbon cutting ceremony May 2 at 11:00 am. Their hours will be 11:00 am to 9:00 pm Sunday through Saturday. You can check out their website at http://stirlingbooks.com. I am excited to see more good things happening in Albion. We are a old town on the move for the future. Thanks to all the good people in our great city.